What better time than the monsoons to put to test a car’s long term use. You must agree that the road conditions at this time is best suited to check the ride quality. With the rains lashing on the windscreen you can gauge how good the visibility is from within; and the pot-holed roads and crawling traffic also make it an ideal testing ground for the car’s maneuverability. And thus, this season made a perfect setting for the latest addition to the ZigWheels Garage – the Maruti Suzuki Dzire Diesel AMT. In just over a month I’ve managed to brave the treacherous weather and clock 1,200km on the odometer. But it’s the last 200km where the Dzire AMT really shone the brightest. Initially, I wasn’t very impressed with the choppy Auto Gear Shift (or AMT) of the Maruti, especially since I had recently got a taste of competition AMTs, which has much smoother shifts in comparison. But last week the rain Gods unleashed their wrath, causing the Mumbai-Pune Expressway drive to be an arduous task. It was pouring really heavily and since my business in Pune was taken care of, I decided to return to Mumbai the same day. And that’s when the Dzire managed to massively impress me with its ability to stretch every drop of the precious diesel, while offering decent cabin comfort and, not to forget, the great driving dynamics. Maruti somehow manages to get the ride quality perfectly tuned for our road conditions and the Dzire is a great example of it. I hadn’t imaged this challenging drive and crawling bumper to bumper traffic could be so effortless, but it was, thanks to the fun to drive nature and auto shift. It’s a brilliant combination that not many cars in this segment can boast of offering. That said, the AMT is not the most seamless, and you have to control the accelerator with a light foot for smoother shifts. The other challenge is while approaching an incline where you pray for the gearbox sensor not to shift early, so that there’s enough drive to overcome the slope. For this again, you have to keep the revs in control to ensure that the trigger- happy sensors don’t up-shift. 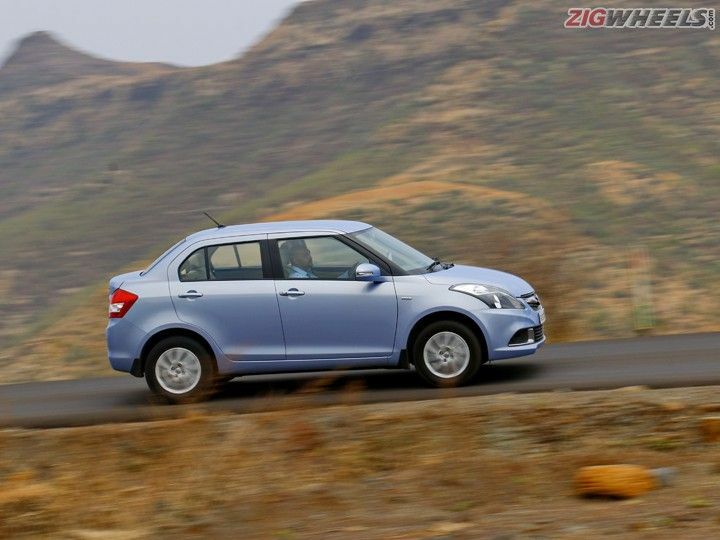 Another feature I would have loved to see is hill hold, so that the Dzire doesn’t roll back if one lets go of the gas and brake while going up on an incline. Coming to the important question of fuel economy or what most Indian search for online - Maruti Suzuki Dzire "mileage". In the city, with the usual traffic I get 15.5kmpl when I drive with a light foot and 14kmpl when I get late for a meet and feed in more gas thoughout the drive. On the highway it always returns close to 17.5kmpl, which is brilliant considering the convenience the AMT has to offer. Apart from the actual drive, I like the new interior design. It looks smarter and there’s more storage space than ever before. You also get a slide-out bottle holder above the glovebox which is strategically located in front of the AC vent to keep your drinks cool. There’s no touchscreen but the Maruti Suzuki Dzire diesel AMT does get audio controls on the steering wheel and Bluetooth connectivity for your smart phone. However, my iPhone doesn’t stream music over Bluetooth and I’m forced to use the USB port (charging cable) to connect my phone to the car’s audio system. It took me over five hours to return to Mumbai as the Dzire braved all odds and battled the unforgiving blows from the rain gods. Whereas, in better weather conditions it takes just three hours. After a really challenging day driving the Maruti Suzuki Dzire diesel AMT, I didn’t feel as spent as I would’ve been in a manual transmission car doing the clutch-gear-clutch-accelerator drill! Like they say about relationships – your hardest times often leads to the greatest moments in life. Here’s to many more long term reports. Cheers!